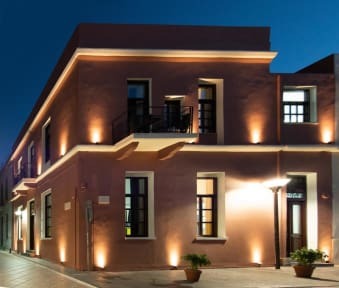 This family run hostel with a friendly and welcoming atmosphere, Intra Muros Boutique Hostel is the ideal place to stay while visiting Heraklion. Our own travel experience has taught us a lot, and helped us build this hostel from scratch, into what we believe the modern traveller wants! If you stay with us, we promise we will show you the true Heraklion! Our guests are welcome to relax after a tiring day in our spacious veranda, that offers views to the city, cook and share a meal in our fully equipped kitchen, or socialise in our indoor and outdoor common areas and lounges. Free internet is available throughout the property, as well as instruments for impromptu jamming sessions, board games, and book exchange. It’s the perfect place for those who want to get to meet other travellers in a home away from home environment. All dorms are spacious and bright, and equipped with air conditioning. Bunk beds are equipped with linens, towels, privacy curtains, power sockets, reading lights, and individual lockers located under every bed. Hector was an amazing host for my stay there. The facilities were always kept immaculate and the room was nice and spacious and had reading light, outlet, and curtain on each bunk! Everything was walking distance from the hostel including the sights, port, Iraklio’s finest restaurants, and more. I would recommend this hostel to anybody traveling to the area. An elegant, comfortable place to stay. It has a nice atmosphere. You have a feeling that you are not in a hostel, but a shared household full with lovely housemates. A wonderful, friendly, clean and modern hostel that ticks all the boxes. Couldn't have asked for a better place to stay in Heraklion. The owners have got it totally right in their approach and attitude. Highly recommended. I stayed here for a week and it was always very clean. It's in the perfect location on a quiet side street in easy walking distance of the center of town, but there's no sign so make sure you get directions first. The three brothers who run it are very friendly and accommodating, even offering me extra pillows and blankets because it was cold. It's got a fully equipped kitchen, and plenty of places to curl up and read a book. The dorms are also very private with curtains and lights for each bed. I had a lovely stay here with the brothers being so helpful with suggestions of where to go in Heraklion and Crete in general. The hostel is clean with very good facilities including a self service kitchen and a rooftop terrace. I will miss this place and hope to come back soon! Awesome Hostel! Run by 3 brothers in a beautiful house that was renovated. Jason was the brother I dealt with the most and he is awesome, he’s always down to tell you the good places to eat and go to. Awesome rooftop terrace, cheap beer, great kitchen. 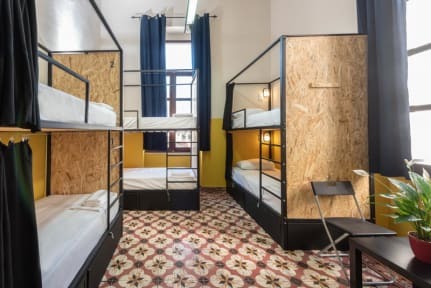 The brothers are also swift to deal with any creepy behaviour of other hostel guests and will evict anyone found to be acting inappropriate. Overall, best hostel I’ve stayed in so far. Bonus points for the privacy curtain and comfy beds. Wonderful hostel, a real hidden gem in the middle of town but tucked away in some quiet streets. Highly recommend! No sign on building. Luckily a staff member saw,me bewildered and,came out to offer assistance..